Another Christmas and another fantastic Christmas Eve dinner! In my family, we do things a little bit differently for Christmas. If you’ve read my previous holiday entries, you know that each year we choose a different regional theme for our Christmas Eve feast. Past years have included Scandinavian, Indian, Cajun, and Greek. We’ve been doing this for a long time now and have nearly covered the globe. While it’s fun to choose a brand new locale, every few years we return to Mexico. Everyone in my family loves to eat tamales at Christmas, and we can only go so many years without having them. This year, I had a brilliant idea—instead of doing a generic Mexican meal, we could focus specifically on the foods of the Yucatan! I ate lots of delicious dishes when I visited that region earlier this year so I knew it would be a good choice. It would allow us to explore a new cuisine while still providing a venue for our beloved tamales. Yucatecan cuisine blends local Mayan flavors with Caribbean, Mexican, European and Middle Eastern influences resulting in what some argue is the world’s first fusion cuisine. It is very distinct from what we typically think of as Mexican food. Perhaps the most famous dish from this region is cochinita pibil, a rich and flavorful pork stew. Robert sampled cochinita pibil in Tulum and loved it. In fact, that dish was the primary reason that I suggested doing a Yucatan feast in the first place. The key to cochinita pibil is recado rojo, a seasoning paste made from annatto seeds (which give it a striking red color) and various spices including cinnamon, allspice and cumin. Recado rojo is a critical component of Mayan cuisine—we used it in at least three of our dishes. To make cochinita pibil, you marinate cubes of pork overnight in the recado and some fresh citrus juice (we did a combination of grapefruit, orange and lime). Then you line a casserole dish with banana leaves and bake the pork until it falls apart. 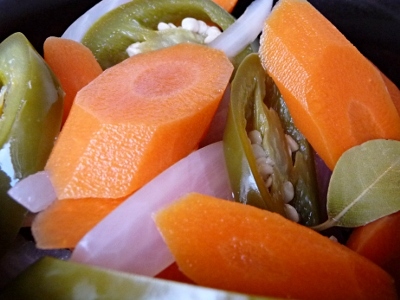 It can be served as a stew over rice or, like we did, as a filling for fresh corn tortillas. Either way, cochinita pibil wouldn’t be complete without the essential garnish of pickled red onions. They provide a bright flavor contrast to the rich stew and are pretty too! The other major dish this Christmas was, not surprisingly, the tamales! 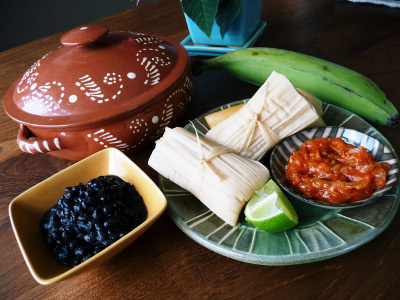 Tamales in the Yucatan are different from tamales in other parts of Mexico. The masa dough in Yucatecan tamales is typically flavored with the all-important recado rojo. Diced tomatoes are usually present, either in the masa or in the filling. Also, the filling is commonly thickened by cooking some of the masa dough in broth (this masa-thickened sauce is called a kol). For our tamales, we simmered chicken with fresh tomato and recado rojo and then shredded it. Next, we thickened the leftover broth with the masa and added the shredded chicken back in. I could have eaten a big bowl of this on its own with a spoon, but it was even better inside tamales. Our masa dough wasn’t too shabby either. We were unable to obtain quality fresh masa so we tried Rick Bayless‘ substitute masa which is made by mixing pulverized corn grits with the powdered masa that you find in big bags in Mexican markets. This is supposed to do a better job of mimicking the masa dough that you typically see in Mexico. It had a more subtle corn taste than what I’m used to, but the texture was light and airy and perfect! Our Christmas Eve tamales came pretty darn close to the wonderful fresh tamales Robert and I ate in Xcalak last winter. Rounding out the meal was a terrific coconut fish stew made with green plantains, sweet bell pepper and—you guessed it—more recado rojo. We also made black beans with epazote, white rice (pilaf-style, as is the custom in Mexico), and a simple spinach salad topped with oranges and jicama. To drink, we served up a family favorite: sangria. It wasn’t as elaborate as some of our past meals have been, but it was certainly delicious and memorable. In my family, if there are tamales on the table, it is guaranteed to be a slam dunk! Happy holidays! Red chili is the cornerstone of Northern New Mexican cooking. If you’ve ever traveled to New Mexico, you’ve no doubt sampled it in one form or another. The word chili usually conjures up images of chunky meat and bean stews. In New Mexico, when someone says chili they are usually referring to a chili sauce made from red or green chilies. Outside of New Mexico, I typically call it chili sauce for clarity’s sake. Around our house, we just call it red for short as in “those tamales would be way better with a little red on top.” Red chili is most commonly used as a sauce for enchiladas, but you can smother virtually any New Mexican and many non-New Mexican dishes with it. In homes, it is offered as a general condiment, available to be drizzled on whatever you happen to be eating that day. Tacos, corn chips, fried potatoes…it all tastes better with a dash of red chili. I personally love it over beans and fried eggs. When I first visited New Mexico, I had no experience with red chili other than on enchiladas. 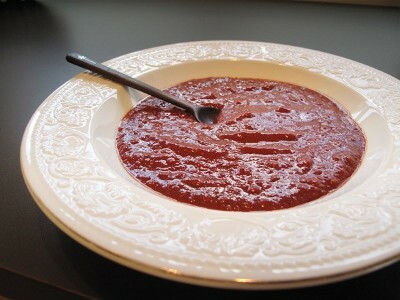 Even then, the sauce that I was used to was a milder, tomato-based concoction. I was slightly taken aback by this thick, spicy, deeply red chili sauce that I kept seeing all over Santa Fe. I was even more surprised when Robert’s family offered it to me as a topping for mashed potatoes at their Thanksgiving feast. What, no gravy? I was hooked immediately. These days, I can’t imagine mashed potatoes without red chili. This has since become a traditional Thanksgiving dish in my family as well. It is delicious and also adds a much needed splash of color to the plate (let’s face it, outside of cranberry sauce, Thanksgiving dinner tends to be a little beige). In its most basic form, red chili is little more than dried red chilies blended with water and perhaps a chopped onion or some garlic. As with all basic recipes, numerous variations exist. Some people make their red chili from whole dried chili pods whereas others prefer the convenience of powdered chilies. Some people add tomatoes, some use stock in place of water, some even add chopped pine nuts! Although Chiles de Ristra (a.k.a. New Mexican red chilies) are the conventional choice, you can make red chili from nearly any type of dried chili. Depending on what you use, your chili may be hot, mild, smoky, or even a tad sweet. Everyone’s got their own family recipe and, not surprisingly, no two are alike. This Thanksgiving, I wanted to make sure my red chili was extra delicious. I have always been somewhat timid about how much chili powder I use, but I was inspired by the intense red chili I had at The Shed when we were in Santa Fe. I decided it was time to go bold and that meant doubling the amount of chili in my recipe to a whopping ½ cup! My adjustment paid off and my chili turned out fantastic, just like the reds I’d had in New Mexico. My family raved about it at Thanksgiving dinner. I finally have a red chili recipe worth writing home about. The only downside is that we are now going to blow through our precious stash of powdered red chili faster than ever! Best Meal of the Year! Robert and I had a fantastic dinner last night at Anchovies & Olives. Halfway through, we had already declared it the best meal of the year! Like many dining establishments, Anchovies & Olives was doing a special prix fixe menu for New Year’s Eve – five courses at $75 per person. That’s not cheap, but in this case it ended up being worth every penny. Each course came with a choice between two different dishes. We decided to keep it simple and order one of each to share. Might as well sample everything, right? Highlights for me included the tiny kusshi oysters topped with green apple ice, the hamachi crudo (raw yellowtail served with blood oranges, shaved beets and horseradish) and the seared arctic char with trumpet mushrooms and braised radicchio. Robert enjoyed the escolar crudo which came topped with spicy coppa, persimmon and arugula. Our favorite dish of all, however, was the squid ink spaghetti with sea urchin, mussels and bread crumbs. The pasta – made fresh in house – had a wonderful firm, chewy texture. Combine that with super-sweet mussels and perfectly crunchy fried bread crumbs and you end up with one truly unforgettable dish. Talk about closing out 2009 on a high note! Christmas Eve 2009 – A Spanish Feast! The paella and the pork & bean stew were the evening’s biggest hits. I was worried about the paella since, in spite of my planning, we ended up making it up as we went along. It turned out great. The rice was cooked perfectly and the seafood was moist and flavorful. We even managed to develop a nice socarrat, the caramelized crust that forms on the bottom of the paella pan and is considered by many in Spain to be the best part. The pork & bean stew was especially tasty. Then again, how could a recipe that calls for spicy Spanish chorizo and smoked paprika be anything other than wonderful? Other highlights included the sautéed greens, which we made using a combination of red chard and Tuscan kale, and the mushroom tartlets, which highlighted my sister’s perfect pie crust. Our Spanish feast will definitely go down as one of the most memorable Christmas meals in my family’s history. Happy holidays! I may have missed out on the fireworks & late-night reveling but the party wasn’t over just yet. For me, the real celebration happens on New Year’s Day because that’s posole day! Every year, I make a big batch of pork posole for New Year’s Day. 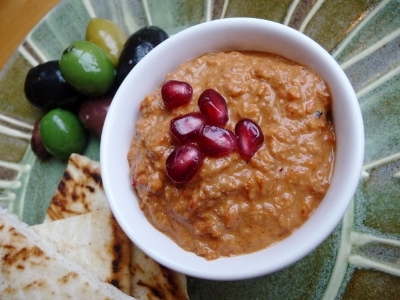 Not only is it a delicious first food to have in the new year, it’s also the perfect remedy for anyone who might have partied a little too hard the night before. This year, my family came over to share in the posole feast. We started off with roasted squash quesadillas and mixed veggies with a dip that I made out of sour cream, pumpkin seeds, cilantro, chilies and lime. Then, it was time for the main event – the posole! I keep my posole very simple: just pork, hominy and onions in a lightly seasoned broth. I cook it for hours so the pork is completely tender. On the side, I provide red chili, chopped white onions and white tequila for each person to doctor their posole with as they wish. This year’s posole seemed especially delicious, perhaps because I used the dried hominy that I got in Santa Fe. After dinner, we snacked on bizcochitos (courtesy of Robert’s mom in New Mexico) and took turns playing with my little nephew. It was the perfect way to ring in 2009! The two highlights of the meal were the tamales (duh) and the pollo en mole (my sister spent several days making the mole from scratch!) The tamales actually gave us a bit of a scare. This was our first time using fresh masa rather than dried masa, and the fresh masa resulted in a much thinner dough than we were used to. It was almost too watery to work with. Fortunately, the tamales firmed up perfectly during cooking, and I think they were tastier than the tamales we have made in the past (fresh masa must be the key!) Although there weren’t really any lowlights, my spicy carrots and jalapeños were deemed too spicy for guests and were therefore relegated to the kitchen where only the bravest souls (like me) would have to venture in to taste them. For drinks, we served several varieties of Malbec and Cranberry and Vanilla Bean Mimosas which have nothing to do with Mexican food but were quite festive nonetheless. Merry Christmas everyone ! Pie is intimidating, particularly when it comes to making the crust. Just type “pie crust disasters” into google and you’ll find tons of tales of pie crusts gone awry. Many pumpkin pie recipes have you pre-bake the crust before adding the filling (also called “blind baking.”) This keeps the crust from becoming soggy but can also be the source for some problems. Steam trapped under the crust can cause it to puff up considerably making for an uneven crust and reducing the amount of room available for filling. Also, the sides of the crust can shrink or sag while baking. In my case, the sides sagged quite a bit; in some places it completely folded over itself like a pair of crumpled socks! I gently eased the crust back up the sides while it was still hot from the oven and was thus able to avoid having my very own pie disaster. However, my decorative edges, which were quite “rustic” to begin with, were all but gone after pre-baking. Oh well, it doesn’t need to look good to taste good! I’m declaring this weekend to be the unofficial start of the holidays. Thanksgiving may not be for another few days, but I’m ready to start celebrating now! People around here get so mad when they see the shops putting up their Christmas decorations early, but I’m a total sucker for it. I just love the winter holidays. Robert won’t allow Christmas music until after Thanksgiving, but I know one way to start celebrating this weekend – by mixing up a special holiday cocktail! It couldn’t be easier to make, and tastes delicious! This is a pretty strong drink; the apple and maple flavors are quite subtle. I suspect that some people would want to increase the amount of apple cider to make the drink more palatable, although I thought the flavors were perfectly balanced. Then again, I might be some kind of lush because I thought the recipe made a perfectly reasonable single serving (it is actually supposed to serve two!) I may try this again using spiced cider for even more of a winter flavor. Happy holidays! 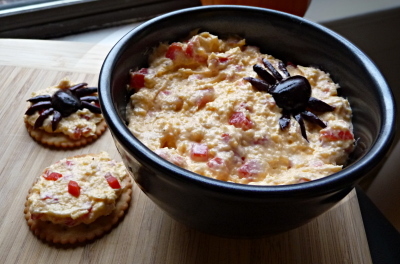 Check out the scary cheddar spread that I made for my company’s Halloween party. Okay, so there isn’t anything all that scary about the spread itself (I mean, the recipe is a little white trash which, in a way, is scary.) The truly creepy part of this dish is my kalamata spider garnish. The spiders weren’t nearly as labor intensive to make as last year’s skull and bones crostini, but I think they’re just as cool. Simply use half an olive for the body, and then cut thin strips for the legs. If you wanted to up the creep factor, you could even use a couple of peppercorns to replicate those gross bulging eyeballs that spiders sometime have. I didn’t go there – the shiny, black kalamata skin gave these spiders enough of a menacing quality for my taste! Happy Halloween!